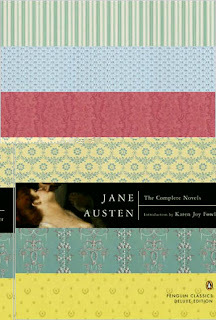 The second entry in my re-reading project for this year is Jane Austen's Emma. Like A Suitable Boy, I've read Emma multiple times before (twice, I think, compared to the half-dozen of ASB), but not for a few years. In this review, I will be a little bit spoiler-y, so proceed with caution if you've not read it but don't want to know what happens. 1) The title character. Austen apparently set out to create a less-likeable central character*, and certainly Emma can be a little unpleasant, especially to modern eyes. Her early obsession with taking on the socially unfortunate Harriet and setting her up with a respectable young man at the expense of Harriet's (returned) feelings for Robert Martin comes across as hopelessly patronising, assuming she knows better than Harriet whom she should marry. (Of course, by the standards of their society, she's right - Mr Elton or Mr Churchill or Mr Knightley would all be very advantageous marriages for Harriet. And two of them also would have made pretty decent husbands too, had they shown any interest in her.) Yet what makes Emma an appealing character is that she learns from her mistakes - after the awkwardness resulting from her efforts to matchmake Harriet with Mr Elton, she takes a much more passive role in hoping for the best for Harriet. Emma also does have a genuine affection for Harriet, as well for quite a few other people in her life. She's sometimes thoughtless - both in her matchmaking and in a particularly cutting remark she makes to Miss Bates late in the novel - but she also feels bad about these and recognises without hesitation when she has erred. 2) All the other characters. For a novel named after a single character, Emma does a remarkable job of filling out its world. There's an extensive cast of well-drawn characters in Emma's life - her family, her friends & associates, and even some people she doesn't like. Admittedly all we ever know about Robert Martin is that he is an excellent young man who loves Harriet, but that is actually probably fairly accurate in some ways. There's no reason Emma would ever know him as anything beyond that - she knows him exclusively from reports from Harriet and Mr Knightley, and they both like him. But elsewhere Austen provides some wonderful characters, including the twin comic pieces of Mr Woodhouse (permanently worried about the health of everyone, including being shocked that someone might even consider opening a window at night) and Miss Bates, surely one of the most annoying but accurate characters in English literature, with her never-ending run-on sentences, starting on one topic but diverting herself constantly before any theme is fully expressed. Frank Churchill is an appealing male lead for most of the story, appearing (to draw a Pride & Prejudice comparison) like the best characteristics of Bingley and Wickham combined. Better still is Jane Fairfax, who allows Austen to hit a beautiful but rarely-expressed character note: most of us know someone we feel like we should like, but we just cannot, without even perhaps being able to say why. That's exactly how Emma feels about Jane, and it's a neat point for Austen to make (and one, incidentally, which helps us identify with and like Emma). 3) The subtle reveal of the romance. Again, to refer to Pride & Prejudice, this is a point in Emma's favour - from the start of the former novel, it's clear that Mr Darcy is the male lead and therefore the ultimate partner of the female lead Lizzie. Emma does a much better job of providing some plausible alternatives for its main character - including the unlikely but oft-expressed option that she will not marry at all. But for most of the novel, Mr Churchill is seen as a possibility for Emma, even if she seems to go off him after their initial (seeming) mutual infatuation. On this re-read, I was quite surprised at how little a role Mr Knightley plays in the first half of the story, and how suddenly their romance seems to bloom (or, more accurately, how late in the novel each realise that's how they feel). The result of this is that it's quite possible to read most of Emma without trying to pick who - and how - Emma will end up with, which makes the late reveal much more satisfying. (A minor quibble here which will make sense only to those who know the story very well: I can't help but feel that she should have received the letter from Mr Churchill before Knightley's declaration. Austen could have made something of Emma reading that Churchill felt free to flirt with Emma because he could tell she didn't care, perhaps making her stop & realise that soon she really would be the only unmarried person in her circle, and that maybe Knightley woudn't return her recently discovered feelings because he too saw her as someone without any romantic feeling at all. But that's just a thought I had, and clearly Austen had other things in mind with Churchill's letter and Emma/Knightley's responses to it.) There's also a neat way here in which, in more subtle terms that Pride & Prejudice, Emma and Knightley will be good for each other - he can provide for her the grounding she sometimes needs, and she can help him see the better side of people than he probably would otherwise. It's no coincidence, although Austen doesn't slap us in the face with this, that each of them are seen to be better people - nicer to those around them, more tolerant of people they previously hadn't liked - because of the other. Knightley is not just an improving influence on Emma; she does the same for him. On top of those, of course, are all the other reasons why people still read Austen the best part of two centuries after she wrote - the wonderful writing, the way in which a social world was depicted (and, honestly, who cares if it's not accurate or representative? that's such a facile reason for disliking a work of fiction - like arguing that you don't like the Sherlock Holmes stories because some of the crimes were a bit far-fetched), and the endlessly entertaining characters and their romances. Austen is not for everyone - a characteristic her writing has in common with every writer in every language - but to avoid her because you struggled through the first quarter of one of her novels in high school is to do a grave disservice to both yourself and one of the great writers. * She would eventually succeed, intentionally or otherwise, with Mansfield Park and the detestable Fanny Price, English literature's least interesting lead character. ** I'm also very fond of 'There was not a dissentient voice on the subject, either when Mrs Perry drank tea with Mrs and Miss Bates, or when Mrs and Miss Bates returned the visit'. Austen could be slyly hilarious, and I sometimes think of her like a grandma, outwardly pleasant, cheery and polite, but not fooled for a minute by those around her, and capable of making the odd cutting remark.